“The manual picking method we were using was driven by a bespoke system which really didn’t give us any management information. 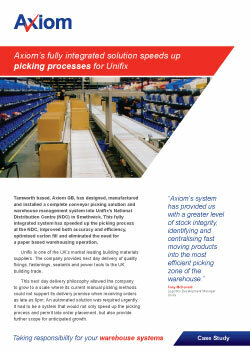 Axiom’s system has provided us with a greater level of stock integrity, identifying and centralising fast moving products into the most efficient picking zone of the warehouse. This has ensured that we have the right product in the right place at the right time in terms of pick frequencies and rate of movements. “We are now able to take the goods to man in terms of the picking operation, locating the picker inside a given zone of the conveyor system where the product is stored conveniently within his or her reach. Our increased pick rate means that we are now picking in the region of 6-7,000 lines a day. This effectively means we could be picking as many as 40,000 items a day.